Instead, HAMMERCRAWL! is a system for randomly generating the “bottom line” elements of a dungeon crawl: Characters, Dungeon Rooms, Traps, Monsters, and Treasure. And it’s certainly not for everyone, especially those who want a more stable, fleshed-out gaming experience that lasts more than a single pick-up or con-game session. In the previous runs with this method, we used my favorite version of the old game, the Dungeons & Dragons Rules Cyclopedia. A big stack of characters were generated via Ramanan Sivaranjan’s Basic Character Generator, ready for the murdergrind of the coming dungeon. Basic D&D worked, more or less, but the big drawback for the group was that first-level thieves were absolutely useless and failed at all the things they were supposed to be good at. This time around I’m planning to run with a mix of Dark Dungeons and Lamentations of the Flame Princess. 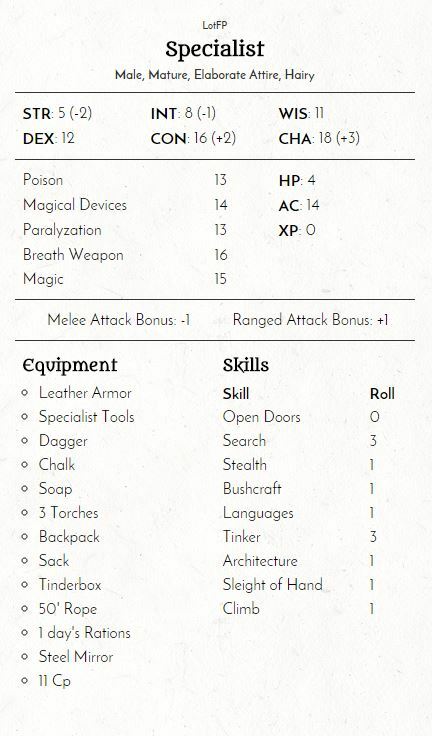 Despite the latter game’s focus on being a horrific fantasy game, its re-write of the D&D skills system (among many other such bare-bones simplifications) makes it easier to parse at the table. And even if this perception is just an illusion, its simpler skills come off as being less whiff-driven than those of other retroclone variants. Plus, there’s an awesome random character maker at that very same website! Now I need a few rounds of pre-con playtesting of the different core pieces of both DD and LotFP, before I can settle on a final result I’m comfortable with. Using the links above, I randomly generate and print out a stack of 100 characters. When a player sits down at the table, they pull a sheet from the top of the stack and hop right into the fun. When a character dies, their player draws another one, and joins the team a room later, either as a random encounter or as someone already fighting a group of monsters. For a project like this, a dice tray is crucial. I recommend this round one, it’s fun to use and round and everything you need. During the first few go-rounds I used nothing more than a simple Chessex d12 Dungeon Die, and it worked well enough. But since then I have been gifted with a set of Dungeonmorph dice, which are far superior in their detail and versatility. I’ve also just received the full set of room cards (and slid them into handy dry-erase sleeves) and a buddy is set to give me the other two sets of dice as well, making my loadout a full complement. They even come with little symbols and a handy key to them, for adding more spontaneous dungeon features on the fly. The basic process involves going from room to room, encountering obstacles, grabbing treasure, and moving ever onward. When it’s time to move to a new room, I grab one of the dice from a bag, roll it, and that’s the next room. I then draw the room out on an index card-sized cut of graph paper that I have a nifty book of thanks to a fellow G-Plusser named Gray Pawn. The pieces are all laid out on the table, and the dungeon grows dynamically as the players explore it. Regarding room exits, one of the interesting features of the Dungeonmorph dice is that every result comes up with up to eight exits, so as to allow the dice to seamlessly connect and the dungeon to infinitely grow. But sometimes that doesn’t make sense for a random dungeon, especially when trying to give it confines. To fix this, my plan is to use a mix of “eyeballing” it and randomly rolling: Roll either 1d8 or 2d4 for each room to determine how many exits are actually there, and then when drawing the room out on the card be sure to leave out the ones that got dropped. With the tile version of these dice, this process is made even easier. Make sure they’re in dry erase sleeves first (Magic card sleeves work), then randomly pull one and lay it down, blacking out walls and exits as needed for the current layout. Finally, for each room visited after the first, there is a cumulative 1 in 20 chance that one of the exits of the room leads down to the next dungeon level. There is no set limit to how many such exits there are on a level; when one is discovered, the count resets to 1. To tell the truth, this entire project of tool-collection is rooted in my love of the custom dice for the third edition of the Warhammer Fantasy Roleplay game. Despite growing frustrated with the actual game, I was really drawn to the dice themselves, and even held onto a small set after selling the rest of the game stuff off. I try to use them for other games whenever possible, and from that desire was born the idea of using them to randomly “divine” an entire dungeon run on the fly. Blue Die: The Reward Die, rolled to find new fortunes and treasure. Red Die: The “Huzzah!” Die, rolled when the heroes are especially brave and/or foolhardy. Green Die: The Caution Die, rolled to reward careful strategy and conversation. White Die: The Luck Die, added to the pool for good ideas and plans. 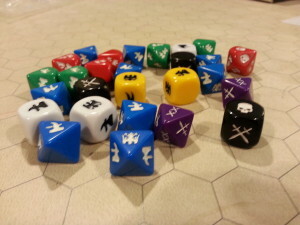 Black Die: The Dark Die, added when the players’ own actions turn against them. Yellow Die: The Die of Expertise, representing solid applied skill and craft. Purple Die: The Die of growing Risk. Purple dice can bring great danger and peril. Standard Risk: Start with one Purple Die, and add one more for every third level of the dungeon (so +1 at 3, 6, 9, etc). Standard Reward: Start with one Blue Die. Did they stealthily enter the room? Add a Green Die. Did they kick in the door and rush the room? Add a Red Die. Did anyone actually say “Huzzah!” when entering? Add another Red Die. Did they fore-warn the room’s occupants somehow? Add a Black Die. Are they taking any clever precautions or plans (other than the usual trap-checking)? Add a White Die for each “really good idea” they have. Do they have any useful tools that might affect the situation? Add a Yellow Die if they are making active use of special gear, such as maps, potions, etc. Hammers and Crossblades: MONSTERS and TREASURE! First off, Hammers and Crossblades cancel each other out one for one. If a roll gets two Hammers and five Crossblades, then that’s a net total of three Blades for that roll. If there are net Crossblades in the pool, the party encounters monsters and must very likely fight with them. The encounter is rolled determined by the current dungeon level. A single Crossblade represents a single encounter, with each additional crossblade either A) increasing the size of that encounter, or B) adding in another simultaneous encounter group. When the encounter is defeated, roll the treasure as normal (see further below). If there are net Hammers, then the party finds unguarded treasure! Roll an encounter as normal, but the creatures aren’t there, and they left their treasure behind. Hammer-Plus: (Yellow die only) Some yellow results show a hammer with a plus. That means to add another yellow die and immediately roll it. Skulls: GROWING DANGER! Skulls are counted over many encounters, tallying up a growing Danger Meter. Every ten skulls counted since the party entered the dungeon adds another purple die to the base pool for following encounters. The Danger Meter resets every time the party leaves the dungeon. Falcons: GROWING HOPE! Similar to Skulls, Falcons add to the growing Hope Meter. Every ten Falcons rolled gives the party a safe place to camp for a bit, recovering HP and Spells. This will be detailed in the Part Two post. Reset the count each time Camp happens. Blood Drops: INJURY! When blood drops are rolled (Red dice only), the team suffered damage or stress of some kind in their charge forward. Roll Xd4 damage (X = current dungeon level) and have the team apply it among themselves. Hourglasses: DELAY! When an Hourglass is rolled (Green dice only), the team suffered some form of delay getting to the next room. Knock off an additional 1d4 Turns of game time. Comets: SURPRISE! The enemies (if any) are surprised! Heroes additionally receive +2 to each die roll that round. Surprise and the bonus last for # of rounds = # of comets rolled. Chaos Stars: TRAP! Roll a random trap, encountered either on the way to the new room, or as part of its composition, whichever makes most sense. Chaos stars bring traps, and to create them I’m using the handy set of generators at the donjon. But why stop there? Here’s a particularly crazy random trap generator. And if all else fails, there is the 1d20 Tricks and Traps table from the AD&D 1E DMG. My intention this time is to copy a dozen loadouts of the Donjon traps and combine them into a single set of tables on one or two sheets. Those will be slid into the covers of my World’s Greatest GM Screen, along with other custom sheets I’m working up from other sources. The current plan is to use the Wandering Monsters table from Dark Dungeons. A single Crossblade means it has basic wandering numbers, two means it has an extra die, and three plus means it is a full-on lair of said creature, when applicable. A bit of common sense is required for working those out on the fly, of course, on a monster by monster basis. Another option (which I’ve used before) is the Swords and Wizardry monster book, which I already have printed, spiral-bound, and heavily tabbed. It has some nifty random tables in the back, which I can put to good use. The only drawback to that is that the monsters in that book lack standard treasure class details, making the next step a bit trickier. For Random Treasure, I’m using a Windows program I found ages ago called BECMI Utilities. It generates treasure based on the Rules Cyclopedia “A-O, P-V” treasure classes, which Dark Dungeons also uses. I’ve made heavy use of these very tables in my own long-running weekend games, and am quite familiar with their typical yields. If I were to use the Swords and Wizardry monsters, a little more effort will be required. I’m still pondering that one. Random Room Setting: Broken Furniture, Chains from the Ceiling, A tentacle slipping around a far corner, bloodstains on the ceiling, a grate in the middle of the floor, etc. A handful (d10) / a bagful (d10 x10) / a chestful (d10 x100) / a hoard (d10x1000) of coppers/silvers/golds/platinums/gems/arts, etc. The key for me is that for any such things to be usable, they need to be immediately on-hand with a minimum of flipping and cross-checking. On-the-fly rapid deployment of dungeon composition is a must! I’ll save the session flow stuff for the next post.